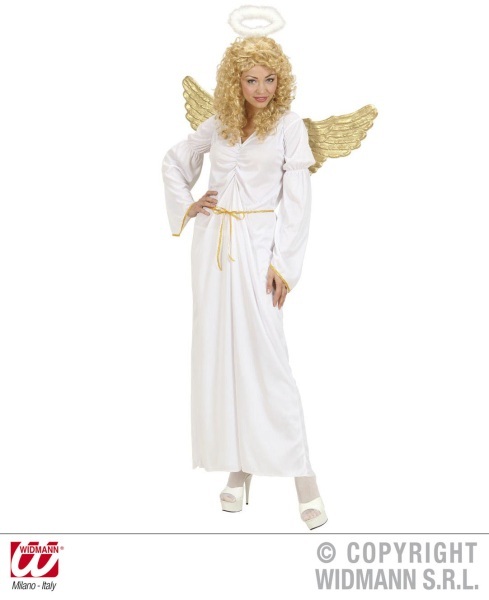 This beautiful Angel costume comprises a dress, wings and a halo. The dress is made of shiny velour, nice to the touch, and in a warm white colour. The sleeves and neckline are trimmed with artificial down, and the sleeves themselves are flared. Our angel dress has a very appealing cut, narrowed at the waist to nicely emphasise the figure. The stretch material used to make the dress means that it fits the wearer perfectly. The wings and halo are made of the same artificial down used to trim the sleeves and neckline, making them incredibly light and airy. The halo is worn like a headband. The suit is available in the following sizes: S (5'5"-5'7"/165-170 cm), M (5'7"-5'9"/170-175 cm) and L (5'9"-5'11"/175-180 cm); for details, see the Measurements chart. We highly recommend this costume for its impact!